Luis is our Desktop Support Tech who assists users by answering questions, and resolving technical problems. He is a dedicated member of the team who never says no to a challenge. 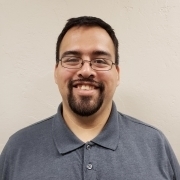 Luis is a Computer Science major at Western Governors University, he loves watching the latest movies that come to theater, and he’s a huge family man!